check-your-boarding-pass line, to get on the bus, and finally, to get on the plane. Over the last few trips, I’ve noticed a certain hyperaggressiveness among passengers in India. able to slide in, and avoid having to go to the back of the line. Very little makes me see red, but this is unfortunately one of them. And so, I make it a point to call them, and ask them to go to the back of the line, even if they’re not trying to slide in in front of me. behind me with my thumb. bully a smaller guy right behind me to let him stand in line, and shadowed me all the way through the bus ride to the aircraft, glaring at me at every concievable opportunity. What’s driving this? 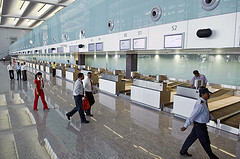 Some of you may say that this is because airline travel in India has become progressively less expensive, and that’s brought a whole new stratum of travelers into airports. People who may be traveling for the first time, in some cases, or less familiar with airport procedure. That could be true, but I don’t think it adds up. Have you had such experiences when you travel in India? Why do you think it’s on the rise? Can something be done about it? If so, what? I’d love to hear your thoughts. This entry was posted in Features on November 20, 2008 by vpdot. Human beings are same everywhere. It is not only in India, but when we go from here we think it happens in India only. I look at this way – may be he had bad day, may be he had bad vacation, bad experience in India – there are so many reasons. 10 years ago I was at the airport and one American was there with lot of frustration. He took India tour and visited many places and took lot of pictures. He had lot of film rolls (as at that time there was no digital cameras) and some one in hotel stole all his film rolls. He was going to write a book on India and his experiences. Now can you imagine his frustration? So there is reason people behave in different way to take out frustration from their system. Lines in India are understandable, because you expect that, but I’ve had to stand in 7 lines at JFK before. First to check in, then to pay for extra baggage, then to check in again, then for baggage scanning, then security, then to get on the jet way, then to get on the airplane. People will be people, I understand that cutting lines is something that technically is against the ‘rules’ but those set of ‘rules’ are defined in a country alien to India. In India its first come first served, that’s the way it has been and that’s the it will be- and there’s nothing wrong with that at all. If he was older than you, you should have let him cut, people will use their ‘I am a Senior Citizen’ card or ‘I’m travelling with a kid’ card- that’s simply human nature and those cards are used everywhere in the world. I guess what you should think about is the fact that someday; you can use those cards as well. As far as airline travel is concerned, it’s not cheap at all by Indian standards, tax prices are obscene and it’s definitely not ‘affordable’ for the masses anymore. What I’ve come to realize about airline travel (and I’ve done my fair share) is that eventually- you’re all going to end up on the plane does it really matter who gets on first? Lines anywhere in India are broken. I’m surprised that someone cares to point it out. But what about the funny security checks in the USA? The computers there somehow ‘randomly’ pick on over 65yrs. retired ladies (like me) for some unexplained and shocking system of blowing some..air..or chemical …or whatever, within a closed glass chamber, with not even an apology. Is USA Paranoid??!! For some reason my mind played tricks on me and I read that as “gas” chamber..horrifying imagery, that. I find that kind of unprovoked rage even in the US.I think it is just a symptom of the stress in our lives today and not necessarily an outcome of having to wait in line. However, here’s an anecdote about “line” frustration. At my son’s school parents had to wait outside the classroom of each individual teacher( there are 6 in all) for the parent/teacher conferences. In one line, after one parent took an inordinately long time with the teacher, a African American parent in line turned to a Caucasian parent and said with a roll of his eyes, “Must be an Asian parent whose child got an A- instead of an A.” He was probably right too! vpdot on Tam Bram I am! Sam Citron on Tam Bram I am!